It Came From A Galaxy Far, Far Away. An Alien Spacecraft crash lands near a small town. David Harmon (Greg Dohler), A local teen reports the crash landing to his College Professor, Dr. William Tracy (Richard Dyszel), who knows a little about Aliens and UFO's, and gets the Prof. to meet him near the crash site. Joe Montague stumbles across the Alien while chasing his daughter down with a Shotgun. 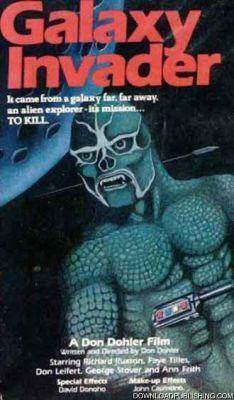 He shoots the Alien but only manages to knock a piece loose from his spacesuit. Soon the local Rednecks are hunting the Creature, planning to profit from its capture and sale. While David and Dr. Tracy try to save the Alien and the Rednecks from each other.